The SniperSpy computer spy solution takes computer spying to a new level. SniperSpy is truly an innovative computer monitoring solution that exposes the truth behind the lies. If you want to know what she is doing while she is online without her knowing, SniperSpy is the computer spy solution for you. The SniperSpy software allows you to install it to a remote computer and begin monitoring the computer in minutes. Watching her monitored computer from a remote location is as easy as watching your TV. You can monitor her computer from anywhere in the world, your office or see what she is doing on the computer while you are in the same room. She will never know. Some of the computer monitoring programs get detected as a virus or spyware. Not SniperSpy. This computer monitoring program comes with a spyware blocker that automatically blocks most of the popular anti-spyware programs from detecting it. 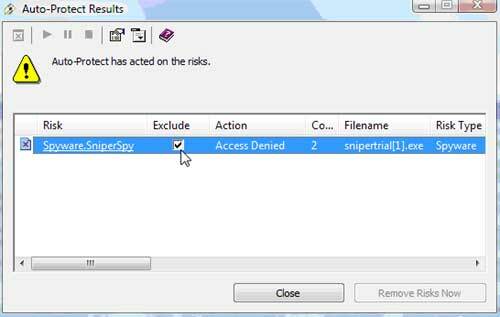 Your antivirus software may still detect SniperSpy as spyware. Most antivirus software allows you to exclude certain programs from future scans. This is a simple process. In my case, I simply checked the exclude checkbox and continued with the download. SniperSpy is equipped with a live web viewer so you can see who she is chatting with as she is chatting. That is when you want to know. As it happens. A majority of online affairs quickly become real life affairs. Here is a testimonial from an actual user of the SniperSpy computer monitoring solution. That testimonial came directly from the SniperSpy website proving that monitoring her computer can confirm what you already suspect. Computer monitoring is especially beneficial if you think she is having a real life affair. The majority of communication is either done by email or chats. If you want to know the truth, SniperSpy will help you find out if she is cheating on the Internet. SniperSpy is a recommended tool by the Infidelity Coach himself - Dr. Robert Huizenga. He is getting more and more questions about spying on your computer to see if there is actual infidelity happening. He often suggests that it is indeed okay to spy and sometimes vital. Read more from Dr. Robert Huizenga here. The SniperSpy monitoring program not only has a Live Screen Viewer but it also logs all of the other things you need to know to catch her cheating on the Internet. This spy program logs the screenshots so you can view them at your leisure. It also logs all applications opened, websites viewed and keystrokes typed. A keystroke logger is especially handy if you want to get her passwords to the many accounts she may have open on the Internet. SniperSpy also records the most popular chat program transcripts. . Here is a screenshot of the SniperSpy main interface. SniperSpy will expose the truth to her lies. All with a click of your mouse. Here is what else is included with the SniperSpy computer spy solution. Customized Username - Unlike others, you'll create your own username and password! Lifetime Tech Support - Should you need help we will provide unlimited online tech support. Free Minor Updates - You will receive free minor updates to the software as they occur. The Truth - You will finally learn the TRUTH about what she is doing!